If you were to look in a mammal field guide you might think we already know where different bat species can be found. However, our knowledge of species distributions is often behind times. Information on changes in a species’ range is usually of higher quality in species with small ranges, simply because these species are easier to monitor. There is therefore a real risk that declines in more widespread species may be overlooked, particularly if these declines occur in the middle rather than the edge, of a species’ range. Indeed, a species range size, as measured by its borders, may remain constant for a long period of time even if local extinctions are occurring throughout its centre, a process known as fragmentation. The species final collapse toward extinction may be so rapid that sufficient conservation intervention cannot be made in time to save the species (see figure). 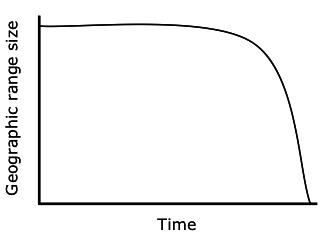 Range declines can appear stable over time, making possible declines towards the centre of the range. Widespread species also tend to be overlooked by scientists who, with limited time and funds, necessarily have to focus attention on species already known to be threatened. In the last 30 years this has led to a real dearth of data on more common species. This is extremely worrying since it means that without these ‘biodiversity base-lines’, ecologists will struggle to map declines in previously widespread species and hence may not be able to find their underlying causes. If we do not knowwy a species is declining it makes it far harder, if not impossible, to reverse that decline. With the help of volunteers, monitoring widespread species across their range becomes much more tractable and means that a better understanding of species ranges over time can be constructed which will prove invaluable in the future should that species start to decline. Volunteer records are as essential to conservation management as museum collections and I like to think of volunteers as curators of nature. In our rapidly changing world it is hard to predict what species will become threatened next but if we are armed with a repository of distribution data we can hope to notice and respond to these changes as quickly as possible. The Bat Detective project, and your key contributions to unlocking the data wtihin it, are therefore a fantastic conservation resource, not just for today but for decades of future bat custodians.